The centre of an impact map answers the most important question: Why are we doing this? This is the goal we are trying to achieve. The first branch of an impact map provides answers to the following questions: Who can produce the desired effect? Who can obstruct it? Who are the consumers or users of our product? Who will be impacted by it? These are the actors who can influence the outcome. The second branch level of an impact map sets the actors in the perspective of our business goal. It answers the following questions: How should our actors’ behaviour change? How can they help us to achieve the goal? How can they obstruct or prevent us from succeeding? These are the impacts that we’re trying to create. Once we have the first three questions answered, we can talk about scope. The third branch level of an impact map answers the following question: What can we do, as an organisation or a delivery team, to support the required impacts? These are the deliverables, software features and organisational activities. Project plans and requirements documents are often shopping lists of features, without any context why such things are important. Without a clear mapping of deliverables to business objectives, and a justification of that mapping through impacts that need to be supported, it is incredibly difficult to argue why certain items should or shouldn’t be invested in. In larger organisations with many project stakeholders or product sponsors, this leads to huge scope-creep as everyone’s pet features and ideas are bundled in. An impact map puts all the deliverables in the context of the impacts that they are supposed to support. This allows us to compare deliverables and avoid over-investing in less important areas of a system. It also helps to throw out deliverables that do not really contribute to any impact that is critical for a particular goal. 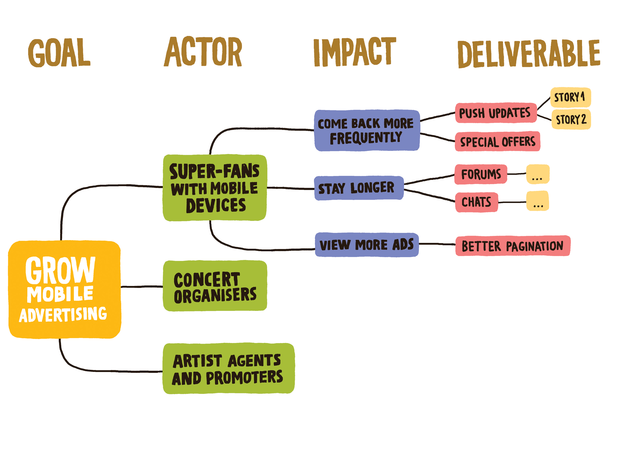 Finally, by connecting deliverables to impacts and goals, an impact map shows the chain of reasoning that led to a feature suggestion. This allows us to scrutinise those decisions better and re-evaluate them as new information becomes available through delivery.